Just a quick addendum to the earlier post about the most visible country in Africa on Wikipedia. Below you see the same data (i.e. 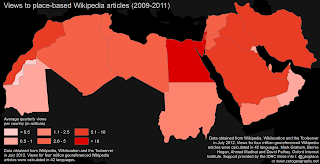 how many people read or view information on Wikipedia about each of these countries), but focused on the MENA region. Egypt is of course the most visible country (for reasons elaborated on in the last post). Otherwise, the countries with the most visibility are Israel and Iran. While the countries/territories that are most invisible in the public gaze are Western Sahara and Mauritania. But unlike the vicious and virtuous cycles of visibility that we see elsewhere when looking at views, edits, and articles, the Palestinian Territories stick out in these data. They have the fifth highest view count in the region (more than twice as many as Lebanon for instance) despite having only a relatively small number of articles and a negligible amount of edits.